So yesterday was all about the pink and the tweed skirt and today I'm showing the same skirt paired with purples and a jean jacket. It was funny when we were taking these pics it was outside of a small business and the business owner happened to be outside. He wanted to know why we chose that particular place to take the photos and then he suggested it was because he hadn't painted the brick in years and it was looking a little run down. He mentioned his wife had been complaining about how he needed to paint it. We let him know it was in fact due to the wonderful old texture on the building that we chose it for the shots. I'm sure he promptly told his wife that there was no longer any need to paint the outside of the building anymore since it was getting lots of attention and free marketing due to impromptu photo shoots. 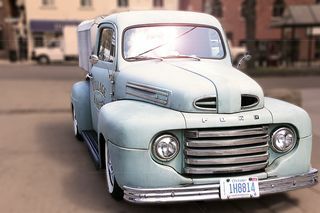 The old truck is a very cool one we spotted delivering baked goods. I like the purple tights with it! Lovin’ the tweed skirt and those gorgeous purple tights!